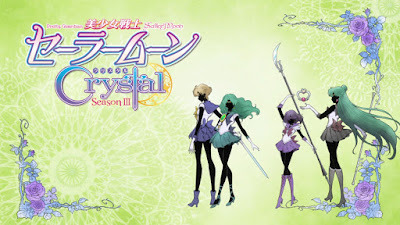 Given the seemingly negative reception towards Sailor Moon Crystal it may seem surprising that Toei Animation would go ahead with a third season. But with plenty of material left to adapt the anniversary-charged, manga-accurate retelling of the legendary magical girl series is back once again with a further 13 episodes to cover the next chapter in the Sailor Moon story – the Death Busters arc. This new season also brought along with it a structural and cosmetic changes, returning as a fully-fledged weekly television series rather an as a bi-monthly ONA (original net animation). Story-wise it also marks the debuts of Sailors Saturn, Neptune and Uranus – joining Pluto to form the “Outer” Sailor Guardians. Following the defeat of Wiseman and the Black Moon Clan, the five Sailor Guardians have returned to the past and continued to live their everyday lives – bringing Chibi-Usa along with them, training to become a better guardian. However it isn’t long before a new threat arrives in the form of the Death Busters – alien lifeforms tasked with gathering human hostes to transport their master Pharaoh 90 to Earth. Meanwhile Usagi and Mamoru’s relationship seems to be tested by racer Haruka Tenoh and violinist Michiru Kaioh, who eventually reveal themselves as Sailor Uranus and Sailor Neptune. Joined by the reincarnation of Sailor Pluto, the three outer guardians reveal their own mission – to defeat the Death Busters and prevent the destructive powers of Sailor Saturn from being awoken. 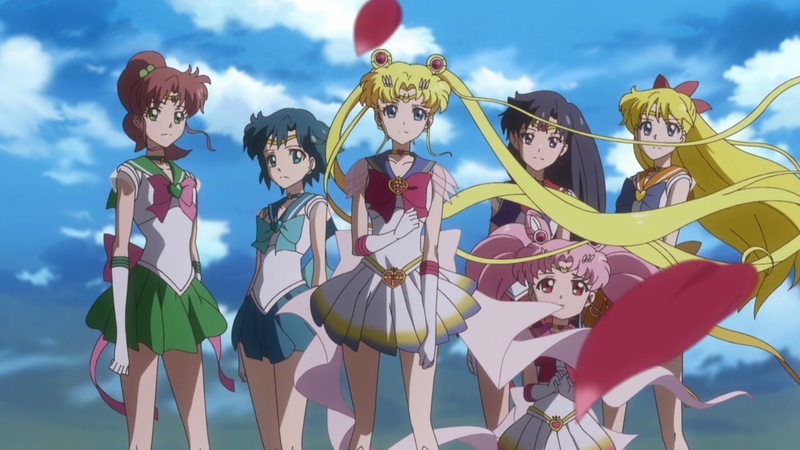 Following the rather heavy criticisms towards the first two seasons of Sailor Moon Crystal it’s no surprise that Toei felt that some changes needed to be made going forwards. Chiaki Kon was chosen as the new director, and with that came some rather significant aesthetic changes to the show. Among the first things to go were the ill-fitting CGI transformation sequences, which were among the most frequent complaints. But together with improved transformations there's also considerably cleaner animation, making the show once again a delight to behold. A similar level of detail also went into animating the characters' various attacks, which each of them suitably flashy and presented in a way a franchise of this stature deserves. However it isn’t just the visuals that benefitted from this shake-up, as season three of Crystal also proves itself to improve the characters themselves in a big way. The spectrum of character development and focus is much wider this time around, and while 13 episodes isn’t nearly enough to provide it do them all in any meaningful way at least here they begin to feel like actual characters. There’s more time for little comedy moments to illustrate their personalities outside of simply “Sailor Guardian”, and each of them also gets to have their own action sequence where they are the centre of attention. Five minutes of momentary downtime goes a long way, and makes the cast feel far more alive than they ever did previously. That said, this time its Mamoru’s turn to be pushed to the sidelines – offering very less and less to the overall story as it progresses. Meanwhile Chibi-Usa surprisingly continues to be the most interesting and well-developed character of the series overall. The new sense of quality is further boosted by the introduction of the remaining Sailor Guardians, which is undoubtedly the biggest selling point of this season. 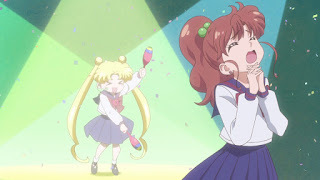 The introduction of Haruka and Michirou is played extremely well, acting as temptation for Usagi and Mamoru respectively as the story slowly builds up to their full identities being revealed to the cast. 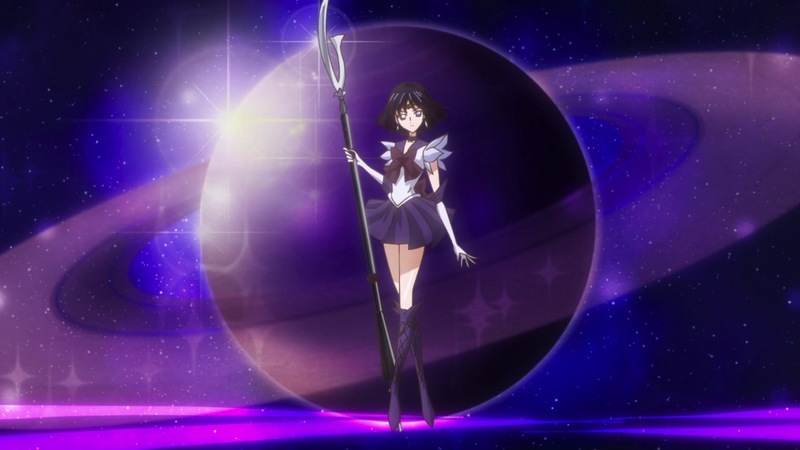 Meanwhile Saturn's overall appearance in the show may be shortlived, but every second counts when it comes to portraying her as unstoppable force of destruction/rebirth that she is. Development instead comes from her human counterpart Hotaru, who's shy and timid nature nicely mirrors Saturn's own lonely existence. 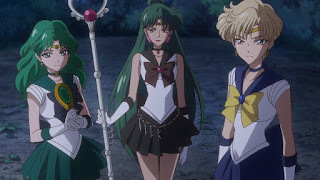 However all these improvements doesn’t mean Sailor Moon Crystal is out of the firing line just yet, as it emerges that season three has its own difficult obstacle to overcome – the story itself. While the Dark Kingdom and Black Moon arcs heavily suffered in the execution department, their respective stories had a personal edge to them that kept them interesting. By comparison the Death Busters and Master Pharaoh 90 feel like generic monster-of-the-week stories. 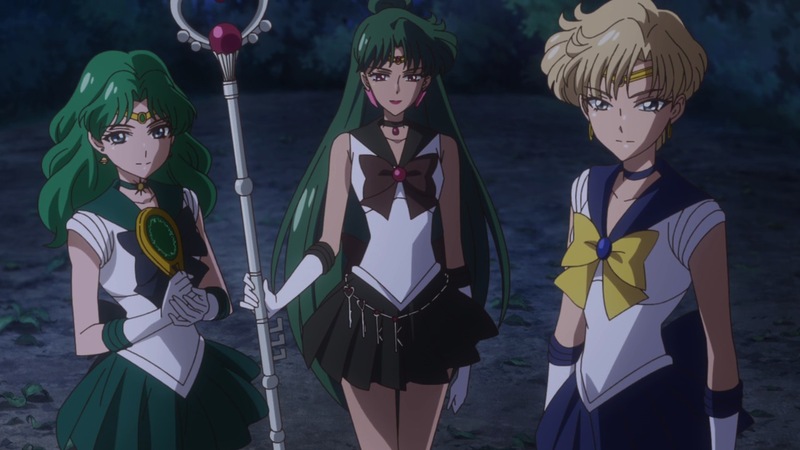 Their weekly plots in the early episodes are completely overshadowed by the more interesting Haruka/Michiru introductions, and following that it's the differences between the two factions of Guardians and their differing ideals that make for interesting content. Even in the near apocalyptic finale, it's hard to care about anything going on with Master Pharaoh 90 because he just feels like a catalyst to bring Saturn into the picture. 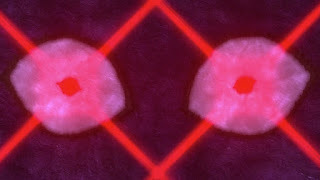 The emotion of the final scene is also sucked out by the show's bizarre obsession of having all the characters' call each other by their Guardian names, which makes everything sound detached and clinical when it should be having the opposite effect. And of course time is still of the essence when it comes to Sailor Moon Crystal. While overall development is definitely improved there's still simply not enough to time to get across what is needed. This makes some important elements, such as Hotaru's father and upbringing, feel more like footnotes in the grand scheme of things. What makes it worse is that even within the series itself time is wasted over and over again on lengthy transformation/attack stock footage. Once again I fully acknowledge that I've never read the Sailor Moon manga, but if Crystal adheres to it as much as I am led to believe it does it makes me wonder whether or not there's any breathing room in this franchise at all. Sailor Moon Crystal season 3 turned out to be a bit of an odd one. While these new episodes undoubtedly fixed the problems that plagued the first two story arcs, it instead struggled with its own lacklustre storyline that failed to reach the same stakes as its predecessors. This could perhaps being attributed to the manga rather than the show itself, however if this is the case then one has to wonder if Crystal trying to stay strictly within its confines is such a good idea after all. On the bright side this season has done wonders for the actual characters, and should a fourth season come along one day (the cliffhanger ending seemed to imply it would) there’s still every possibility that this remake could come along with something really great. Season 3 was poorly drawn. A reboot is a good opportunity to make the series BETTER not worse. TOEI failed on the art and animation department. Be it CGI or not, epic fail. I grew up in the 90s so my expectations as a fan was a bit high, and it was not met with SMC. If you want to compare the quality of another 90s anime, just look at the art quality of Fushigi Yugi. It's not perfect, but for the most part, the entire series was well-drawn. God, take off the nostalgia googles, 90's Sailor Moon is ugly even by 90's anime standards. 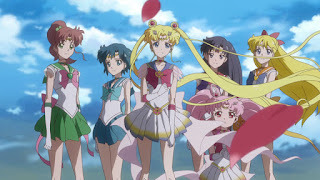 The show is plagued by off-model shots (Often entire off-model episodes), courtesy of an atrocious key designer rotation of artists who would rather flaunt their personal art-styles than be consistent with the primary character designs; just Usagi's odangos change shape, size and color in almost every scene; character's bodies change radically from episode to episode, with faces being particularly noticeable since they go from almost triangular with tiny eyes to perfectly round spheres with giant eyes depending on the key animator, outfits and accessories change sizes and colors arbitrarily all the time too (Especially the tiaras and earrings). The first two seasons in particular have horrible animation outside of the gorgeous transformation and attack sequences, with entire cells full of characters missing limbs, heads and coloring. All in all, only SuperS had consistently decent animation, Stars started out ok (With the first few phages like Sailor Idol and Sailor Guts being really well designed and animated) but they clearly burned through the budget halfway through considering just how horrible the characters looked in the finale, either that or they changed their key animator at the worst time possible and got someone with a giant chin fetish because goddamn Usagi had a chin the size of Tokyo. First Impressions: Love Live Sunshine! !